Experienced breeder of 40+ years! Our puppies are bred in a State licensed, regularly inspected kennel. *Because we raise our own puppies* we can control the quality, temperament, genetic soundness and provide your family with a sound, healthy, well socialized, loving puppy. You are welcome to come to our home in Northern Wisconsin to meet the parents to your potential puppy. 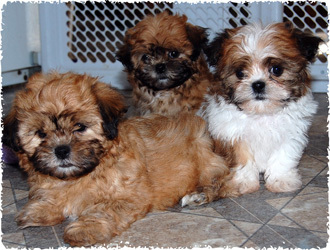 We have purebred puppies that conform to the breed standard. We also have Toysized Designer puppies available, most often first generation crosses. All our puppies have exceptional temperaments, especially for families with children and the elderly! All puppies are bred for excellent temperaments, long life, health and compatibility with children!!! Vaccinations and Dewormings current. Dewclaws normally removed. Spay/neuter information provided. A Spayed/Neutered pet is a Happy/Healthy Pet! We try to help you choose the perfect puppy to fit your family needs and lifestyle! Click on the Puppies or here to see available puppies. We are available to answer any post sale questions.